Washington (CNN) -- Top Democratic and Republican congressional leaders met with Chinese President Hu Jintao on Thursday, using the occasion to raise strong concerns about Beijing's commitment to human rights and economic issues such as the protection of intellectual property. Hu met with Senate Majority Leader Harry Reid, D-Nevada, and House Speaker John Boehner, R-Ohio, among others. Neither man attended Wednesday night's White House state dinner in honor of the Chinese leader. Earlier in the week, Reid called Hu a "dictator" -- words that were later recanted by his spokesman. Boehner noted that the concerns relating to tensions on the Korean peninsula also were raised during Thursday's talks. China to become world's top power? 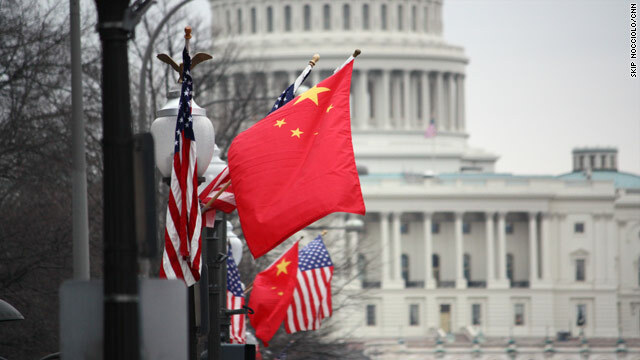 China on course to outpace U.S.
We had "a good meeting," Boehner said. "I would hope that the dialogue on all of these subjects would continue." Disagreements over human rights -- including China's treatment of imprisoned Nobel Peace Prize Laureate Liu Xiaobo -- were "raised very strongly," according to Rep. Howard Berman of California, the top Democrat on the House Foreign Affairs Committee. "I would not indicate there was great engagement ... other than a general recognition by the president of China that they have a ways to go," Berman told reporters. On Wednesday, Hu met with President Barack Obama behind closed doors at the White House for several hours as top officials from both countries worked to address a range of issues tied to the global economic crisis, international security, the environment and human rights. Obama administration officials used the president's meeting with Hu to highlight economic progress between the two countries, announcing Beijing's approval of $45 billion in new contracts for U.S. companies to export goods to China. The contracts will support an estimated 235,000 American jobs, according to the White House. The two leaders acknowledged continuing differences on human rights, but they pledged to keep working on such issues in a "frank and candid way," according to Obama. Human rights is always a touchy subject in China, as censors in China have made clear during Hu's visit. The censors blacked out CNN's news broadcast each time human rights was mentioned. Even when Hu spoke about human rights, it was blacked out. Hu, who started his three-day trip to the United States on Tuesday afternoon, was treated to a military honor guard and review at the White House -- part of the traditional pomp and circumstance reserved for visiting leaders of major powers. Obama hailed Hu's visit as a chance to lay a foundation for the next 30 years of Sino-American relations. "At a time when some doubt the benefits of cooperation between the United States and China, this visit is ... a chance to demonstrate a simple truth," Obama said. "We have an enormous stake in each other's success. In an interconnected world, in a global economy, nations -- including our own -- will be more prosperous and more secure when we work together." Hu declared the relationship between the two powers to be one of "strategic significance and global influence." Under "new circumstances, and in the face of new challenges, China and the United States share broad common interests and important common responsibilities," he said. "Our cooperation as partners should be based on mutual respect," he added. "China and the United States should respect each other's choice of development path and each other's core interests." The formal state dinner for Hu on Wednesday evening was the third such occasion of Obama's administration. Among the 225 dignitaries who attended were former presidents Jimmy Carter and Bill Clinton; former secretaries of state Madeleine Albright, George Schultz and Henry Kissinger; Supreme Court Justice Stephen Breyer; actor Jackie Chan; Washington Gov. Chris Gregoire; and designer Vera Wang. Herbie Hancock and Lang Lang were to provide entertainment after the dinner. While Hu was at the White House, he joined Obama in a meeting with key business leaders. The list of corporate executives taking part in the discussion included Lloyd Blankfein of Goldman Sachs, HSBC's John Thornton, Intel's Paul Otellini, Motorola's Greg Brown, Microsoft's Steve Ballmer, GE's Jeff Immelt and Boeing's Jim McNerney. Hu later met with Secretary of State Hillary Clinton and Vice President Joe Biden at the State Department. He was scheduled to head to Chicago Thursday after the meetings on Capitol Hill. During a news conference with reporters Wednesday, Obama said he had received a promise from Hu to establish a more "level playing field" for U.S. trade. China's currency, Obama said, remains undervalued -- a key factor in America's trade imbalance with Beijing. The two countries need to develop a "win-win situation as opposed to a win-lose situation," he said. Obama on Wednesday defended his administration's decision to engage with China despite those differences over hot-button issues such as human right. Obama pointed out that "China has a different political system than we do" and is at a "different stage of development." "I have been very candid with President Hu about these issues," Obama told reporters, and "occasionally, they are a source of tension." But "we can engage and discuss these issues in a frank and candid way," he said. Hu defended his country's human rights record, arguing that "China recognizes and also respects the universality of human rights." At the same time, he said, it is important to account for "different national circumstances." "We will continue our efforts to improve the lives of the Chinese people" and promote "democracy and the rule of law," he said. At the same time, Beijing is willing to engage with Washington on the basis of "mutual respect" and the principle of "noninterference" in domestic affairs.